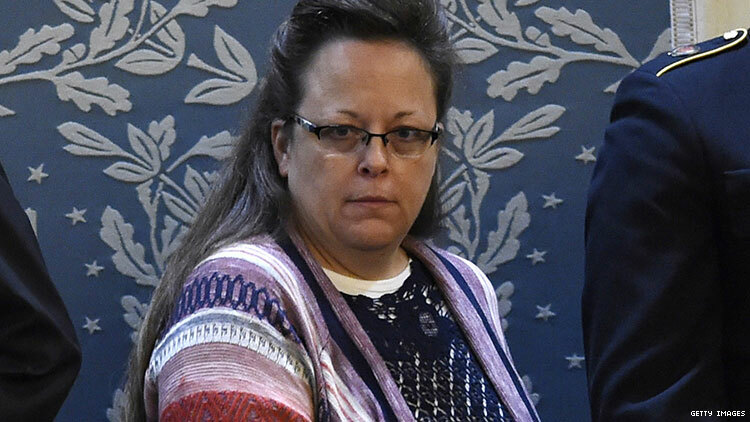 Human-shaped wet fart Kim Davis, the legal clerk who refused to issue marriage licenses to gay couples in Kentucky, might be finding out that it doesn’t pay to be a bigot. According to lawyers for Kentucky Governor Matt Bevin, Davis should be fiscally responsible for the legal fees of the couples who sued her in 2015, which total nearly $225,000. Justice is gay, motherfuckers! Last spring, Bevin called Davis an “an inspiration ... to the children of America,” but his attorneys don’t seem that inspired by Davis’ homophobia. “Her local policy stood in direct conflict with her statutory obligation to issue marriage licenses to qualified Kentucky couples. The local policy also undermined the Commonwealth of Kentucky’s interest in upholding the rule of law,” Bevin’s attorney Palmer G. Vance II wrote in a brief, as reported by the Lexington Herald Leader. It’s not all good news: Bevin “continues to support” the message behind Davis’ actions (being a disgusting homophobe, that hair, etc), just not their financial ramifications. In July of 2017 a federal judge ruled that the couples who sued Davis weren’t responsible for the ACLU’s legal fees, meaning the state is. But the governor’s lawyers believe that Kentucky’s taxpayers shouldn’t foot the bill for Davis’ actions, meaning she may be required to cover it herself. Talk about passing the buck. Davis’ 2019 isn’t off to a great start, and 2018 wasn’t all that cute for her either: in November, she lost her bid for reelection to Democrat Elwood Caudill Jr — and let’s celebrate that!